It "is the collective name for the first ten amendments to the United States Constitution. They were introduced by James Madison to the First United States Congress in 1789 as a series of legislativearticles. They came into effect as Constitutional Amendments on December 15, 1791, through the process of ratification by three-fourths of the States." 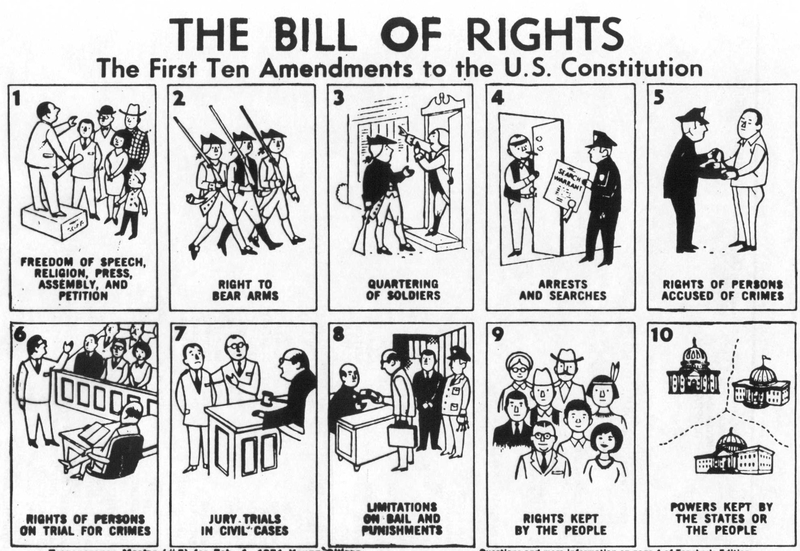 "In 1941, President Franklin D. Roosevelt declared December 15 to be Bill of Rights Day, commemorating the 150th anniversary of the ratification of the Bill of Rights." - "a click-and-explore activity that puts you in control and ask you to consider how life would change without some of our most cherished freedoms. Life Without the Bill of Rights? invites you to understand the significance of your constitutionally-protected rights including freedom of religion, speech, and press, freedom from unreasonable search and seizure, and the rights of private property." - the Declaration of Independence, the Constitution, and the Bill of Rights. Included: Activities that involve students in creating time lines and posters, writing new amendments, and much more!" "The First Amendment says that you can think or say whatever's on your mind..."
You’re never, never, never going to forget the Bill of Rights"